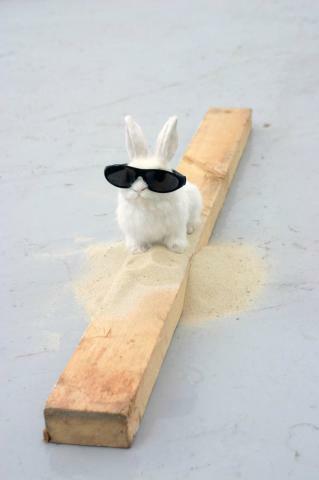 I was greeted by a small white rabbit sat upon a plank of wood, ears pricked, he wore a cool pair of shades, sand carefully scattered at his feet. I really liked this dude, but I wasn’t sure why? I noticed other stuffed animals dotted about the space including a dazed and confused cat that seemed to have been pricked with tufts of hair. Startled, it stood poking its head around the corner glaring at me worryingly. Was this cruel I thought? Did that matter? What other creatures would I find? I ventured further. Perhaps this phrase would stick in my mind beyond his opening, once again I wasn’t sure? The space felt cluttered and mixed up, but it was interesting how this apparently unorganised mess, seemed to drag the open exhibition as a whole, quite effectively into a more coherently curated thematic presentation of new work. The idea that an ‘Open Exhibition’ shouldn’t just present new work, but present a successfully curated show alongside any talent spotting aspirations it may have was more evident here than ever before; in any of these kinds of shows I had seen, but did that make it successful? These messages became tangled in an already untidy space, making it difficult to feel anything other than a sombre, cynical atmosphere, hardly joyous. But the gems were here, I just had to hunt them down, dodging the zoo of butterflies and guinea pigs on my way. 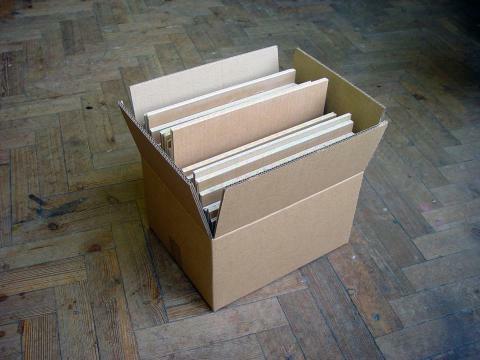 A small cardboard box sat casually conspicuous on the floor, filled with sheets of the same material. Deliberately made to look found, the piece was no accident but the result of an obvious craft like activity of filling the corrugated sides with polyfilla and colouring in each semi-circular shape delicately with coloured pencil. This beautification of the mundane was, “cheap as chips,” exclaimed Anders, and yes it was, but is this low-cost aesthetic done to death? Was it anything new? It didn’t really matter as I had eventually found my joy.